Saudi Arabia and other oil rich Gulf Cooperation Council (GCC) allied states like the UAE have long managed to escape the scrutiny of media and international human rights bodies thanks to their deep pockets and security relationship with the West. Their collective oil, weapons, and infrastructure investment interdependency with Britain and the US have generally translated into Western governments, media, and human rights organizations toeing the party line on the gulf sheikhdoms, content to (with a few sporadic exceptions) uncritically present them as some kind of “reform-minded” terror-fighting benevolent monarchies looking out for democratic interests and championing human rights. This is currently being demonstrated more than ever during Saudi Crown Prince Mohammed bin Salman's (MBS) extensive and ongoing tour of the United States after a visit to the UK earlier this month. The kingdom’s heir apparent landed in Washington nearly two weeks ago and met with Trump and other high US officials before embarking on a multi-city tour across the United States. 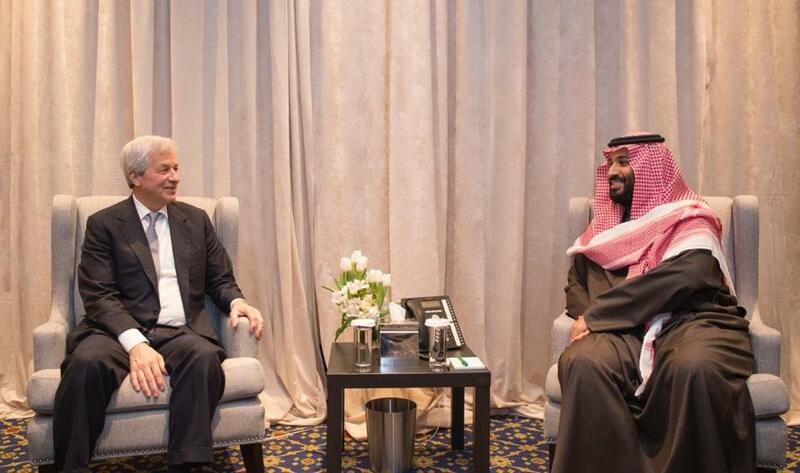 Last Tuesday MBS met with Bill and Hillary Clinton, Kissinger, Senator Chuck Schumer, and UN Secretary General Antonio Guterres during a stop in New York City. On Friday, he also met with the CEOs of Morgan Stanley and JPMorgan, James Gorman and Jamie Dimon. He is scheduled to stop in Seattle and then California over the weekend, where he plans to strengthen ties with tech companies while meeting with Northwest business leaders. Not unexpectedly, mainstream media and politicians have fawned over the 32-year old prince's visit. 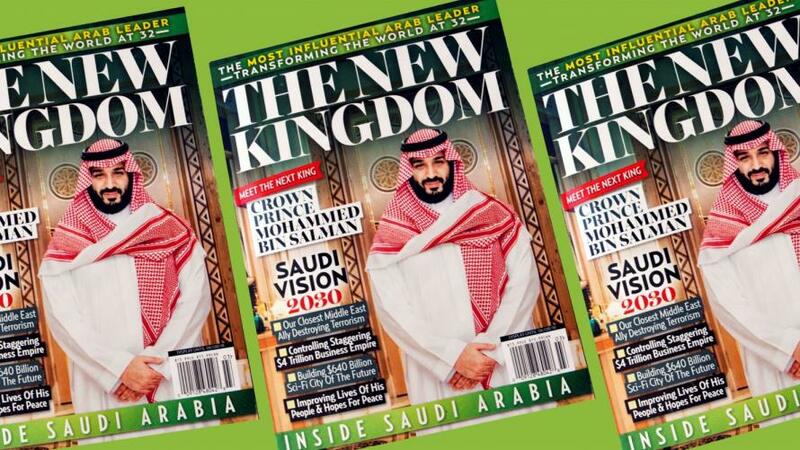 Americans can even find a slick, nearly 100-page, ad-free magazine at their local supermarket newsstand which is entirely devoted to praising MBS and his "New Kingdom" (in the words of the magazine's title), produced by the owner of the National Enquirer - American Media Inc. The magazine of course has conveniently left out news of Saudi Arabia's vicious 3-year long scorched earth bombing campaign over Yemen, which has left millions of Yemeni civilians displaced since 2015, and according to conservative UN estimates from early this year, has killed over 5,000 civilian noncombatants. However, yet more hard empirical proof has emerged demonstrating that MBS and his allies in the West are decimating entire cities and civilian infrastructure in already deeply impoverished Yemen in their fight against Houthi rebels. France 24 recently produced a graphic, based on satellite imagery captured through the opening two years of the war, showing just how devastating the Saudi coalition aerial campaign has been in Yemen's capital city of Sanaa - which had a population approaching 2 million people before the war, and is the country's largest city. Satellite radar data from the European Space Agency shows the extent of Sanaa's destruction. The capital of Yemen, part of which is listed as a UNESCO World Heritage Site, is in the grip of the war that has ravaged the country for three years. Satellite image analysis shows the shocking extent of Sanaa destruction. Source: MASAE Analytics via France 24. "The extent of the destruction in Sanaa is quite considerable, since the whole city is affected, said Emmanuel de Dinechin, associate director of Masae Analytics, interviewed by France 24. There are visible areas on the map that were targeted from the beginnin, and which were pounded fairly frequently during the period of analysis." The US itself has been an integral part of the coalition (also including Bahrain, Kuwait, UAE, Egypt, Sudan, and with the UK as a huge supplier of weapons) fighting Shia Houthi rebels, which overran the Yemen’s north in 2014. Saudi airstrikes on the impoverished country have involved the assistance of US intelligence and use of American military hardware. Cholera has also made a comeback amidst the appalling war-time conditions, and civilian infrastructure such as hospitals have been bombed by the Saudis. The war in Yemen has been drastically under-reported in US media, which tends to focus almost exclusively on human rights in places like Russia or Syria, where President Bashar al-Assad is consistently portrayed as little more than a homicidal maniac bent on massacring his own civilian population. But as we reported last summer, the United Nations is in possession of a secret report which details a litany of horrific war crimes on the part of the coalition, including the bombing of dozens of schools, hospitals, and civilian infrastructure. “The killing and maiming of children remained the most prevalent violation” of children’s rights in Yemen, according to the 41-page draft report obtained by Foreign Policy. The chief author of the confidential draft report, Virginia Gamba, the U.N. chief’s special representative for children abused in war time, informed top U.N. officials Monday, that she intends to recommend the Saudi-led coalition be added to a list a countries and entities that kill and maim children, according to a well-placed source. Early in the war the prestigious Columbia Journalism Review produced a short study which attempted to explain, according to its title, Why almost no one’s covering the war in Yemen. Other analysts have since criticized the media and political establishment's tendency to exaggerate Iran’s presence in Yemen and further willingness to ignore or downplay the clear war crimes of US client regimes in the gulf: while Iran-aligned states and militias are framed as the region’s terrorizers, the Saudi-aligned coalition’s motives are constantly cast as praise-worthy and noble. Meanwhile, the Pentagon this week reiterated its official (Orwellian) line that the US military's deep level of assistance to the Saudi bombing campaign is actually geared toward reducing civilian harm. As Al-Monitor reports: "Speaking to reporters at the Defense Department on the heels of a meeting with Saudi Arabia’s Crown Prince Mohammed bin Salman last week, Mattis said a contingent of US advisers deployed to help with intelligence sharing are engaged in a 'dynamic' role to help ensure a reduction in civilian harm." But Al Monitor also notes that civilian deaths have continued unabated, while further quoting Mattis as saying, "This is the trigonometry level of warfare." So the official Pentagon line on Yemen seems to be that as it directly assists the Saudis in dropping bombs on civilians, it is actually helping those very civilians. Interesting logic.